Keep recipes organized in this deluxe binder from New Seasons! The hardcover binder includes 50 full-color pages for recording your favorite recipes, 6 pocket dividers, a page protector, helpful cooking hints and tips, and more. With sections for Appetizers, Soups & Salads, Main Dishes, Side Dishes, and Desserts, this ingenious binder will be a constant kitchen companion! And as a special bonus, you'll find three decorative magnets and a matching magnetic notepad inside the front cover. 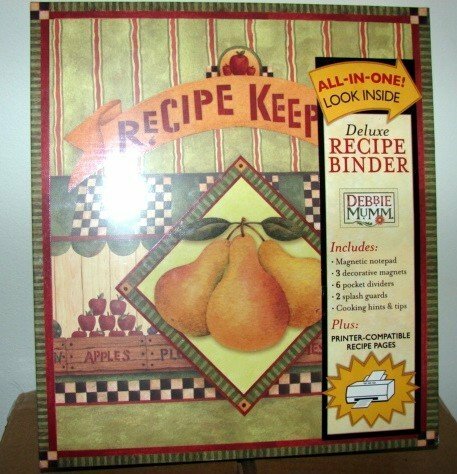 Sprinkled with quaint illustrations, this unique recipe binder will be a delightful keepsake. The recipe pages are printer-compatible, and instructions for formatting and printing are included. The binder is made of metal and boardstock. Features 128 gloss art paper with a linen emboss.